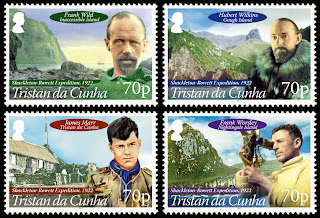 Home » Tristan da Cunha - Shackleton-Rowett Expedition 1921-1922. » Tristan da Cunha - Shackleton-Rowett Expedition 1921-1922. Tristan da Cunha - Shackleton-Rowett Expedition 1921-1922. Still a youngish man, only in his late 40s, Sir Ernest Shackleton planned to explore the Polar Regions yet again and had planned to go to the Arctic on an expedition financed by private individuals and the Canadian government, but when they backed out leaving the expedition close to collapse, the merchant John Rowett stepped in with financial support. Whilst in Rio de Janeiro Shackleton suffered a heart attack but would not let the ship's doctor examine him. This delay resulted in Shackleton sailing directly to South Georgia and Quest arrived there on 4 January 1922. At 2am on January 5 1922 Shackleton called for his physician asking for sleeping pills complaining that he was in pain and the aspirin he had taken was not working. The physician warned him that he needed to take things more easily and stop working so hard; Shackleton replied with the words "You are always wanting me to give up something. What do you want me to give up now?" These were Shackleton's last words, shortly afterwards he suffered a massive heart attack and died at the age of just 48. At first Shackleton's body was sent to Montevideo to be returned to England, but when Lady Shackleton heard the news of her husband's death she asked that his body be returned to South Georgia where she thought he would have wanted to be. He was buried in the whalers' graveyard on South Georgia at Grytviken. Command of the expedition passed to Frank Wild who had previously sailed with Mawson, Shackleton and Scott. They headed southwards through the Weddell Sea and then up to South Georgia where they erected a cairn in Shackleton's memory and visited his grave. From here they went to Tristan da Cunha, where they carried out a number of depth soundings and met with the islanders of Tristan da Cunha. Quest finally sailed for South Africa on 8th May where the crew enjoyed the hospitality of the Prime Minister, Jan Smuts, and many local organisations. They also met Rowett's agent with a message that they should return to England rather than continuing for a second year. Their final visits were to St Helena, Ascension Island and St Vincent. On 16 September 1922 they entered into Plymouth Sound bringing massive amounts of scientific data with them including valuable deep-sea soundings. Frank Wild the eventual commander of the expedition with an image of Inaccessible Island and the Quest in the background. Hubert Wilkins the Australian War Hero, Ornithologist and Polar Aviator with an image of Gough Island in the background. James Marr, the scout who was chosen to accompany the Quest and who would later sail with Mawson and become the leader of Operation Tabarin during World War II with an image of Tristan da Cunha in the background. Frank Worsley the New Zealander who had navigated the James Caird lifeboat for Shackleton in 1916 after the Endurance was crushed in ice with an image of Nightingale Island in the background. Etiquetas: Tristan da Cunha - Shackleton-Rowett Expedition 1921-1922.